Sun jewel melons, cantaloupes, heirloom tomatoes, fingerling potatoes, kale, rainbow chard, garlic, crookneck squash, bell peppers, eggs and cheese. Some foods you recognize right away; others you have to ask about. This is only a small slice of the amazing local foods found at the Albuquerque Downtown Growers’ Market in shady Robinson Park one Saturday morning in late August. And the story is pretty much the same whatever growers’ market you go to this time of year. Until late September, local food is at its peak. Bring a cart, a basket, some strong friends, or all of the above to help you carry your groceries, because this is the time to stock up. Don’t be afraid of over-shopping. What sometimes feels like a lot at market inevitably turns into less the minute you get home. The lovely green beans you bought for Saturday night dinner suddenly turn into a nicoise salad for lunch. The cherry tomatoes left on the counter are gobbled up. Eggs on Sunday morning envelop most of the chard and several Italian frying peppers. Dinner on Sunday includes a cucumber salad plus most of the lettuce. Then there is food to be put in the freezer. What was once a huge, oversize bag of basil is now full-bodied pesto neatly stacked in the freezer. The wonder of that fresh flavor in the middle of winter is well worth the slight mess it made Saturday afternoon. I’m already thinking about the other foods I need to buy in bulk and put up for winter. Green beans are a necessity: they are next on the list. All it takes is a quick blanch in hot water followed by an ice bath to lock in the color and freshness, and they will be ready for a deep freeze. About 100 pounds of fresh tomatoes has become an annual tradition that gives us lots of great sauce for all the months ahead until it is tomato season again. This year I will try roasting them before I put them through my small Italian food mill that removes seeds and stems. Then I cook several large pots of basic tomato sauce with good garlic and basil and seal them away. Do you love kale? You can even blanch and freeze this versatile vegetable that makes everything taste healthier. After you wash the kale, simply trim the middle stem by folding the kale leaf in half and running a knife down the middle edge to remove the stem. Next, chop the kale into bite-size pieces and repeat until all your kale is washed, trimmed and chopped. Next, blanch the kale in a big pot of boiling water for about two minutes, remove it and put in an ice bath. Dry the kale well with a salad spinner and on a big towel. Then flash freeze the kale by putting a single layer on a cookie tray lined with parchment paper and setting it in the freezer for about 30 minutes. Finally put the frozen kale into airtight containers of your choice and freeze until you are ready to eat. Storing the season’s freshest food is always worth the effort. I find freezing much easier than canning or pickling, but those are two other great options for keeping your favorite local foods on hand for many months to come. Harvest time is also the perfect opportunity to support organizations like the Rio Grande Agricultural Land Trust, which works to protect New Mexico’s natural resources and the rural quality of life in Bernalillo, Sandoval, Sierra, Socorro and Valencia counties. Check the accompanying box for details about Sunday’s harvest dinner fundraiser. 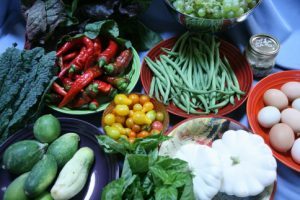 Make the most of this gorgeous time of year in New Mexico and fill your bellies, refrigerator, shelves and freezer with the best-tasting food our hard-working farmers are growing and harvesting right now.